Someone’s journal is usually or at least to me kept away from any other person but to that it belongs to. “Any Human Heart” however is Logan Mountstuart’s journal. It is a place where I never thought I would find myself. I have a journal and write it with the thought that no one else will ever read it. I write in such a way where I allow myself almost total freedom. I say almost total freedom because I know that one day it is possible that someone may find all my journals and read them. The people who will maybe one day get the chance to read them will either make discoveries of what I really feel or think to themselves that they knew how I felt all along. What originally drew me to this book was my uncle saying that this blog reminded him of this book. In those words I instantly thought to myself – I had to read it. In that moment I did not realise what I would be getting myself into. Mr Mountstuart writes in a very honest voice about what happens in his life, there isn’t any of the “Dear Diary” stuff but it is very much a detailed description of his life. His incredible life. He lived through every decade of the 20th century. To be a part of this was at sometimes very intense and in other times very enjoyable. Because of this there were times where I wanted to stop reading. I kept going because Logan himself kept going. He kept living despite the moments in his life where he wished he had not lived through. Towards the end of the story (without giving anything away) you understand that he was a person who simply wanted to live. He wanted to live every encounter of life. The highs and lows. The joys and woes. The light and dark. Every part of it needed to be lived and through his eyes it was. I do not believe that unless you read this story you will truly understand what I am trying to say. When my uncle told me about the book and how it spanned over every decade of the 20th century. I thought to myself, it would be interesting to see what that meant. I did not believe until I read it how much change one person could be confronted with. Trust me – there was in this book an amazing amount of change – some of it drastic and some of it smaller but all of it had huge influences to where his life took him. 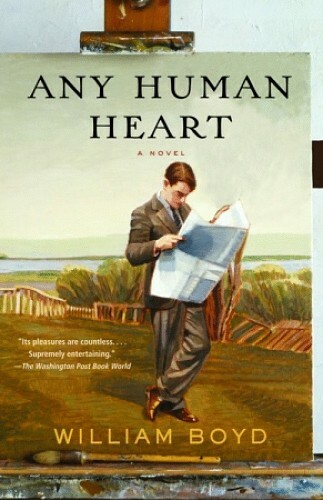 “Any Human Heart” by William Boyd I believe is a must read. I do not believe that I could rate it out of ten because of how personal it is but I do believe that every page takes it’s time to unravel and reveal a life that was much lived. It proves to us or at least certainly to me that life is worth living. I would like to thank my uncle who told me about this book – I don’t think I would have known about it or read it if it wasn’t for him. Signing off because I need to get back to doing things I need to but do not want to do… urgh.